Soften the chickpeas in water for approx. 12 hrs., drain. Blitz the chickpeas in a food processor. Finely chop the coriander, press the garlic, deseed the chillies and chop finely. Mix the chickpeas, coriander, garlic and chilli with all the ingredients up to and including the salt, knead well by hand until the ingredients have combined to form a compact mass. Divide the mixture into 8 portions. On a baking tray lined with baking paper, use a metal ring to cut out medallions (approx. 10 cm in diameter). Brush the medallions with oil. Bake: Approx. 30 mins. in the centre of an oven preheated to 180°C. Tear the leaves off the parsley and coriander. Whisk together the lemon juice and oil, season with salt. Add the micro greens, parsley and coriander, mix. Stir together the yoghurt and cumin, season with salt. 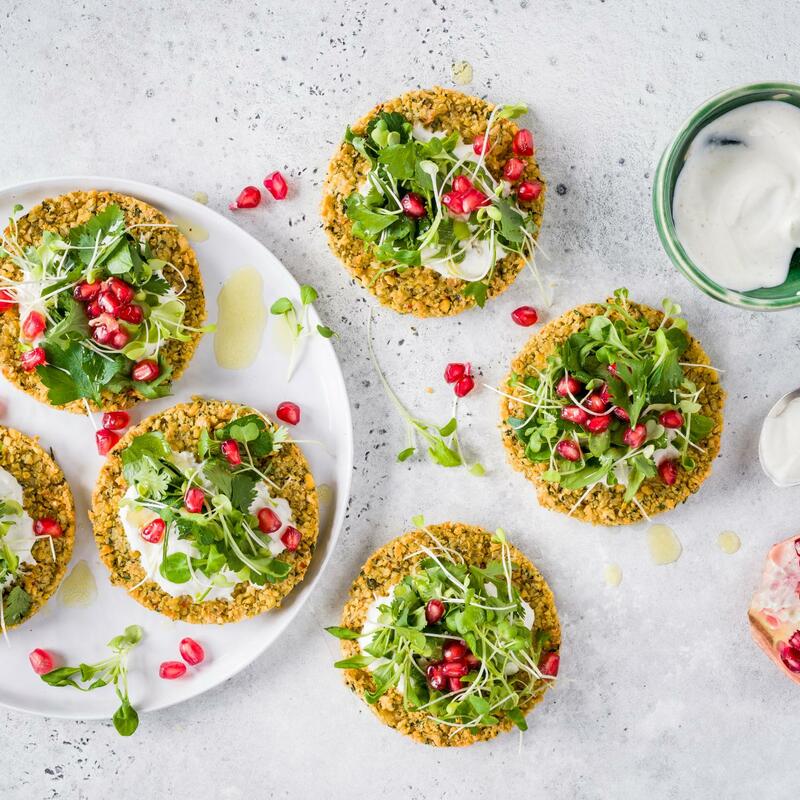 Spread the yoghurt over the falafel mini-pizzas, scatter the herb salad over the top. Scatter with pomegranate seeds.